The United States Congress designated the Mokelumne Wilderness (map) in 1964 and it now has a total of 104,050 acres. All of this wilderness is located in California and is managed by the Forest Service. The Mokelumne River bisects remote mountainous terrain where elevations range from about 4,000 feet near Salt Springs Reservoir outside the southwest corner to over 10,000 feet on Round Top Peak in the north. Shallow valleys lying north of Mokelumne Peak (9,332 feet), in the southern portion of the area, hide many small lakes. The river canyon is extremely rugged and poison oak grows in profusion along the banks. In general, though, glaciers have smoothed the area, leaving the well-placed trails relatively easy to hike. 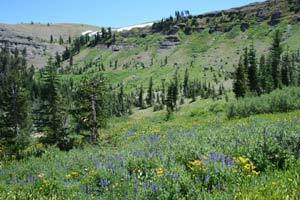 In spring and summer, several large meadows scattered throughout the wild land bloom with a riot of wildflower color. You'll find stands of timber over much of this Wilderness. No fires are allowed above 8,000 feet, and in the Carson Pass Management Area including Winnemucca, Round Top, Fourth of July, and Emigrant Lakes, and on the north and east sides of Salt Springs Reservoir. The Raymond Peak area located in the eastern section, provides some additional mountain scenery. By late summer, seasonal water courses are often dry. A prolific trail system that includes 20 miles of the Pacific Crest Trail contributes to moderate to heavy human use in the Carson Pass Management Area. Most use occurs along the shores of Winnemucca, Round Top and Fourth of July Lake. The remainder of the wilderness area has far less use and provides many opportunities for experiencing solitude. Planning to Visit the Mokelumne Wilderness? How to follow the seven standard Leave No Trace principles differs in different parts of the country (desert vs. Rocky Mountains). Click on any of the principles listed below to learn more about how they apply in the Mokelumne Wilderness.